Laksa is a taste sensation—a delicious one-pot soupy combination of mild, chili-hot, rich, aromatic and delicate flavours, and a tantalising combination of crunchy, soft and milky textures. 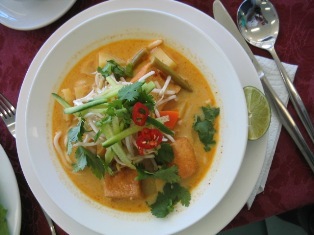 There are many versions of laksa served throughout the Malaysian peninsula. This is my hearty vegetarian version. Serves 6-8 persons. Place the beans and a little water in a small saucepan and steam the beans for 10 minutes or until tender. Drain and set the beans aside. Dry-roast the cumin seeds, coriander seeds and dried chilies in a small saucepan or non-stick frying pan over moderately low heat for 5 minutes or until fragrant and slightly dark. Place the spices in a spice mill or coffee grinder and grind them to a powder. Set the powder aside. Heat the oil in a large heavy-based saucepan over moderate heat. When hot, add the shredded ginger and galangal. Fry for 2 to 3 minutes or until opaque and fragrant. Add the sliced lemon grass, fry for another minute, or until fragrant. Sprinkle in the yellow asafetida powder, fry momentarily then add the tomatoes. Stirring occasionally, cook the tomatoes for 5 to 10 minutes, or until they are soft and broken down, and the oil is visible. Add the dry-roasted powdered spices, the curry powder, black pepper, potato, carrot and vegetable stock. Stir to combine. Cover with the lid, bring to the boil, reduce the heat, and simmer for 10 to 15minutes, or until the vegetables are tender. While the curry is cooking, cook the noodles briefly in lightly salted boiling water, or according to directions. Drain and keep hot. Add the tamarind puree to the simmering curry, then add the cooked beans, the sugar, salt, fried tofu, and the coconut milk. Allow the mixture to almost return to the boil, then remove the saucepan from the heat. Scoop a large handful of hot noodles into each individual pre-warmed serving bowl. Ladle on the curry. Garnish with bean sprouts, cucumber, shredded laksa leaves, and black pepper. Serve with wedges of lime and optional sambal oelek.